Labor Day in Paradise and an Exceptional Deal on Private Yacht Charters! Symphony II is offering motor yacht charters at an attractive deal in the Bahamas! In honour of Her Royal Highness, spend 7 days onboard over Labor Day (Monday 2nd September) at a rate of $49,500 and receive the 8th day FREE!! Symphony II is the perfect exclusive yacht charter to say “farewell to summer” with 8 days of total relaxation… Spend time onboard with the family for a fun filled get-away or perhaps treat yourself to a romantic charter with someone special. Private yacht vacations offer you the freedom no other cruising holiday can, and no boating experience is necessary. 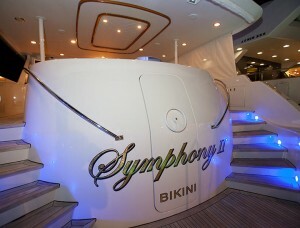 Symphony II has a 6 star track record and many repeat charter clients. So take advantage of their Labor Day special and enjoy 8 wonderful days on an exclusive yacht charter that you will never forget. Four beautifully appointed guest cabins, all with en suite facilities for up to 8 guests and crew of 5 professionals to take care of your every need. The Captain knows the Bahamas like the back of his hand and will take you to many beautiful islands to enjoy water sports of all kinds, snorkeling, diving, wakeboarding, kayaking, waterskiing and much more. Visit the famous Atlantis resort for a night or two and when staying in the marina aboard a luxury private charter yacht you can enjoy the resorts 1st class facilities, then go exploring in this beautiful archipelago with no set itinerary and a Captain and crew that can show you the best and most uncrowded locations. Luxury Yacht Charters Caribbean. For the Winter Season 2013/14 the 112ft Symphony II will be doing private yacht charters based in the US Virgin Islands and the British Virgin Islands, she will also accept charters in the St Marten and St Barths areas of the Caribbean. Each of these locations offer a diverse array of islands and activities to enjoy and custom itineraries will be arranged for you. BVI yacht charters are great for 1st time charterers as the islands are close together with calm seas which are perfect for all types of water sports for beginners and experienced athletes. Caribbean charters in St Marten and St Barths are always popular and famous for night life and celebrity spotting as many of the world’s largest and most exclusive motor yachts are based in this area. Antigua & Barbuda, 90 miles south of St Barths is another superb location for your motor yacht charter and offers plenty of diversity, direct flights from many European and US cities. This perfect location for yacht chartering as also the home of Nicholson Yacht Charters and Services, we are based in the Historic English Harbour of Nelson’s Dockyard where chartering in the Caribbean first began. Green Island is one of our premier anchorages and very close to the exclusive Mill Reef Club Antigua, a must see area for anyone chartering a yacht for their Caribbean yacht vacations.